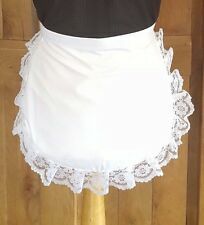 LADIES ADULT VICTORIAN EDWARDIAN STYLE APRON WHITE. LADIES apron 19 iches in length. anti pilling so will not leave those little bits which appear with. Tumble dry or line dry. Quality white cotton. ONE SIZE ITEM WITH SOFT LACE TRIMINGS. CHILD MAID HAT /FANCY DRESS. maid STYLE. anti pilling so will not leave those little bits which appear with. Machine washable at 40 degrees. Quality WHITE cotton. 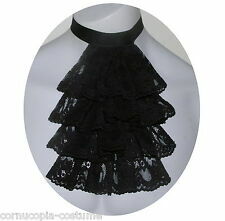 The Jabot is made from black lace mounted onto a backing which will be made from faux silk, satin or taffeta depending on availibility, the neckband is adjustable as it is fastened with Velcro at the back of the neck. ADULTS MAID HAT /FANCY DRESS. maid STYLE. CHILD sizes available. anti pilling so will not leave those little bits which appear with. Machine washable at 40 degrees. Quality WHITE cotton. The blue hat will top off your little girl's Evacuee look. Fancy Dress. 9-10 Years. Frill Lace Hem. 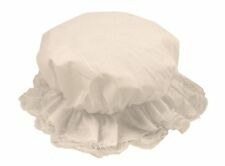 Ladies Victorian Maid Mop Hat. Easy to wear, hat style. / Error: Error with API /. The bonnet is made from a cream damask type fabric. This is a beautiful quality hand crafted bonnet and would be perfect for any Victorian event. You would certainly stand out from the crowd wearing this bonnet. This top is polyester but is made to look like cotton. A very versatile blouse, it is pe rfect for theatre, role play, cosplay (looks great underneath strappy, lace up peasant/house maid/serving girl dresses, etc. or under a corset). WHITE COTTON WAIST APRON. 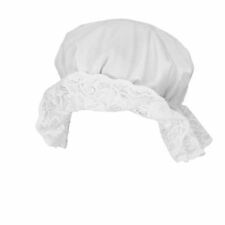 WHITE COTTON MOP CAP WITH LACE TRIM (pattern on lace may vary but will be white). This is a beautiful quality hand crafted bonnet and would be perfect for any Victorian event. You would certainly stand out from the crowd wearing this bonnet. The bonnet is made from a dog tooth check poly viscose tartan fabric which has a wool like feel and look to it. 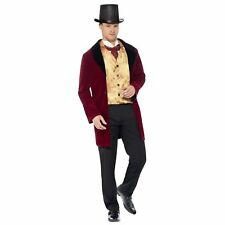 Adults Extra Tall Stovepipe Hat. Ideal for Victorian Fancy Dress. Foxy Fancy Dress LTD. The jabot can be worn with just a shirt and waistcoat or with a jacket or coat, it is perfect to wear with a Montrose doublet or for a town crier. Six luscious layers of white lace, gathered and attached to a double white satin back. Satin style lapels and two button fastening. Back of collar to end of coat 51". Outside sleeve from shoulder seam to cuff 25". No lining. 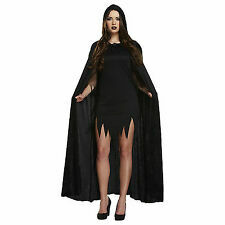 The cape has a long under cape and a short over cape. It is approx 23.5"(60 cm)from the back neck to the bottom. 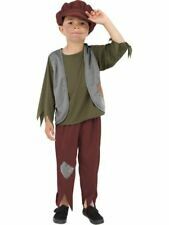 The cape is fastened with two decorative cream frog fastenings ( design of frog may vary due to availability). No overlocking is used on the cape at all adding to the quality. X76372 - Steampunk Skirt. Steampunk Skirt Only! 100cm in length. Looks superb. Size details of one bustle Pls Kind prevail! Waist around(include the strap Length ):about 147cm/57.8". Strap Length: about 124cm/48.8". 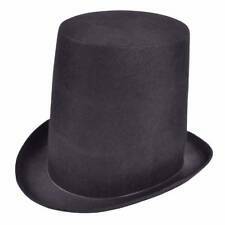 THIS HAT IS PERFECT FOR MOST VICTORIAN STYLE CHARACTERS. PERIOD HAT WITH FEATHER DETAIL. made with love by. Victorian/Edwardian Short Velvet CAPE & Black HAT Fancy Dress One Size. 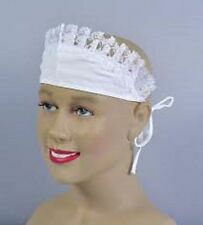 Victorian Mop Cap Hat With White Lace Ladies Women Fancy Dress Accessory.